If you require quick loading of materials which aren't easily damaged or vulnerable, hiring a flatbed vehicle service is the ideal solution for you. At Geo. 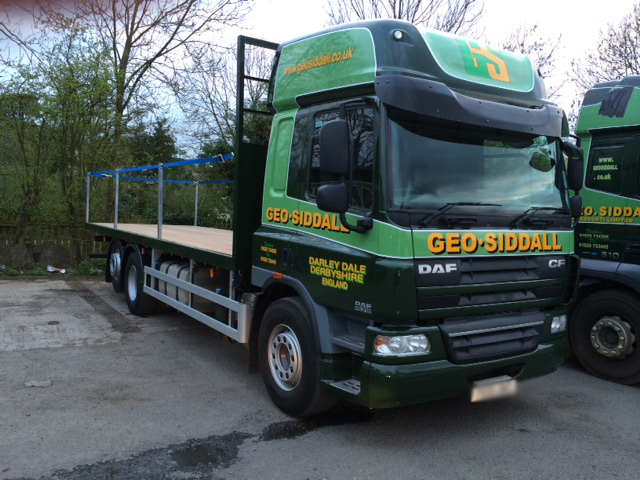 Siddall, we operate articulated flatbed lorries, which comprise of a flat, open body to transport heavy equipment. These types of vehicles are usually used for handling of construction or agricultural equipment. Having specialised in flat bed lorry handling for over 50 years, we have the long-established expertise, licenses and industry knowledge to meet and exceed your expectations. Our flat bed vehicles are all fitted with tracking devices to enquire the on-time collection and delivery of your goods. This means less stress and better efficiency. You can also take advantage of our competitive prices for hiring our services, whether you are based in the UK or overseas in Europe. To find out more about how flat bed loading can help with your haulage project, or to request our services, call 01629 734205 or email sales@bjwaters.co.uk.